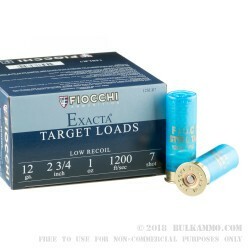 A 250 round case lot of the superior target load offering from Fiocchi, which utilizes Fiocchi’s expertise in in-house production; the economies of scale and the innovation that Fiocchi is famous for, to produce one of the best bargains in steel shot based shotgun ammunition anywhere. 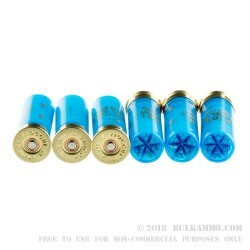 This is a standard shotgun load for the 12 gauge 2 ¾” shell and features a #7 steel shot cup that weighs in at 1 ounce to compensate for the small differences between lead and steel in the wind and in flight. This is a dedicated low-recoil round and yet, still achieves enough power for consistent performance on the range with the clays and other target options as well as the cycling of mainstream firearms including semi-automatic shotguns without a lot of tweaking or changes to the gas system. 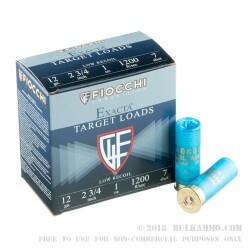 While it is slightly limited to certain game because of the steel payload, this offering by Fiocchi can still take out numerous game animals, including ground squirrels, rabbit, small birds like pheasant and chukar as well. It is capable of dispatching coyotes out to about 35 yards and shows an exceptional amount of versatility for those shooters who need to be able to justify a single round for multiple uses.